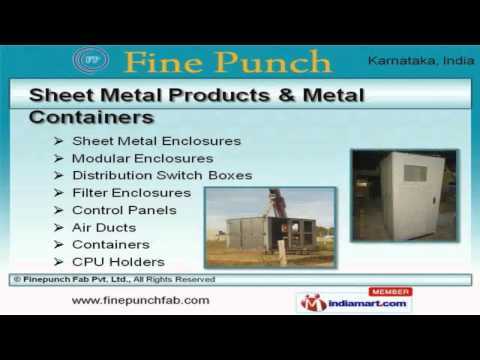 Welcome to Fine Punch, Manufacturer and Supplier of Sheet Metal Products and Electrical Panel. An ISO 9001:2008 certified company, established in 2006 at Bengaluru. State of the art infrastructure and Team of skilled professionals are the strengths of our company. International quality standards, excellent quality of products and market leading prices are some of the key factors behind our success. We offer a diverse range of Sheet Metal Products, Retail Shipfit Equipment and CNC Turret Punching Services. Our Sheet Metal Products and Metal Containers are well known for their durability. Electrical Panels and Stainless Steel Products offered by us are extremely reliable. We also provide Retail Shipfit Equipment and CNC Turret Punching Services that are setting a benchmark in the market. Precision Sheet Metal Fabrication and Shearing and Bending Job Works are best in the industry amongst others. Our clients can avail from us an exquisite range of Waste Bins that are cost effective.